Can you imagine a world without access to the Internet, Social Media or YouTube? Well, for many disabled people computers can be inaccessible due to keyboard and mice design or from the lack of alternatives available. Writing from a personal perspective, I was forced into the tough task of transitioning from a Laptop trackpad to a PC with a mouse. Initially, I resigned to the fact that it would be impossible for me to use a regular mouse. Facing this obstacle made me feel powerless, unable to communicate with friends, play games or continue my work. My PC setup is completely mouse-only however I effectively use the inbuilt Microsoft On-Screen Keyboard. A mouse is placed between both of my hands, whilst my wrists rest on 2 sponges so that my fingers end up at the right height to reach the mouse. Let me paint a picture for you of the biological barriers I face. Duchenne Muscular Dystrophy causes progressive muscle deterioration, so presently I can only move my hands and fingers. It also drastically effects my energy levels, causing me to quickly fatigue especially after prolonged repetitive movements. I decided to persevere in my search for the right input device by testing the different options of mice available. A tough task when there isn’t a one-stop shop for disabled people to try out accessibility devices before purchase. So, after numerous purchases of unsuitable mice, from touchpads, trackballs, upright mice even joysticks. I finally found the perfect mouse for me. The Logitech Gaming G502 Hero. It ticked all the boxes, clearly designed with quality in mind, reliability, innovative customisable features and user comfort. Aesthetically the G502 looks gorgeous, especially with the bright RGB lights flashing. What attracted me to the G502 was the 11 programmable buttons, adjustable sensitivity levels and the lightweight 121g design. It also comes with 6 adjustable weights to further tailor the mouse to you. The mouse has a unique feature to instantly swap between a notched scroll-wheel to a hyper-fast spinning one with a click of a button. Perfect for either reading a comic book online or should I say reading an article. The G502 is ready for constant heavy usage, killing aliens is such a gruelling task so you expect to hear a reliable click from your well-oiled machine. The mechanical microswitches also activate with lightweight pressure so ideal to decrease my level of muscle fatigue. Increasing the DPI sensitivity levels enables the cursor to smoothly move around the whole screen with only minimal finger movement. The rubberized texture of the mouse is comfortable in your hand, with good grip. I always like to put my custom stamp on everything, so I further modified the grip by sticking Velcro strips in optimal positions for my fingers. The Logitech mice all connect to the Logitech Software which it’s intuitive and easy to use. It allows you to program commands and macros to each of the 11 buttons, for example, I have radically altered the button for Right Click. The internal memory-slots store up to 5 profiles so you can take your personal setup anywhere. My favourite programmable command is called G-Shift, pressing it brings up a second layer of buttons ready for customisation. Just like a box of chocolates. After speaking to Chris Pate, the Awesome (Logitech Gaming Project Manager) and discussing the unintentional accessibility of the G502 mouse. I thought that an ambidextrous layout would be better for me due to how I hold a mouse. I also was in the need for a wireless mouse for use at conferences, so Chris kindly sent me the new ambidextrous wireless Logitech G903. The G903 has a fully-configurable button layout, 110g weight with an ambidextrous design ideal for all grip types. It functions superbly exactly like the G502 but with even more advanced functionality. The G903 mouse can switch between the LIGHTSPEED wireless and wired modes without any lag whatsoever. This portability caught my eye, as the wireless nature allows me to use my Microsoft Surface Pro 6 away from home. The buttons are all well positioned and as comfortable to press as the G502. The Logitech Powerplay Wireless Charging Pad is revolutionary allowing constant power to your mouse through integrated wireless charging capability, with no lag or wires to halt your continuous battle to protect Earth. I’m greatly appreciative of the work done by Chris Pate and Logitech for their innovative user-focused design. Accessible Technology like the G502 & G903 enable me to live a meaningful and productive existence, advances in the technology industry are vital for the evolution of accessibility. Welcoming in the New Year has always been a contemplative time for me. Time to take stock of everything I’ve read, watched, done, played & heard in 2018. So I’m going to be speaking about Mental Health, in various forms of media from games to comic books. 2018 has seen the release of some brilliant games, from Spider-Man to Red Dead Redemption 2. 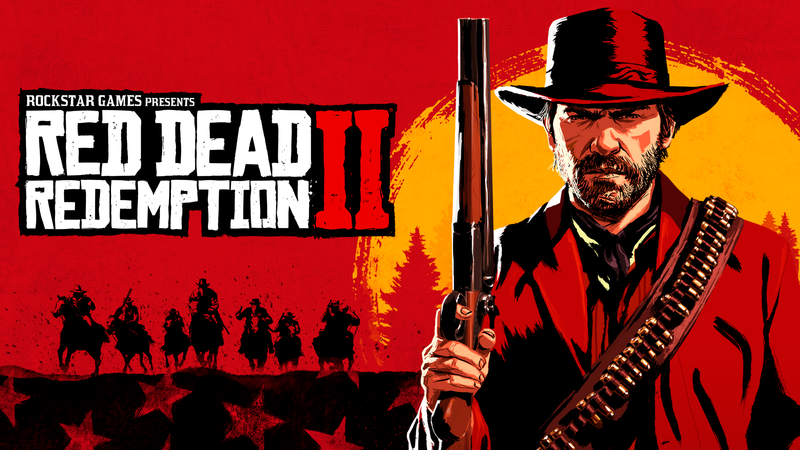 Personally, Red Dead Redemption 2 has transformed my perspective on the importance of gaming, it’s the experiential element that is important for me. The realism of the living world is on another level. The world doesn’t revolve around you, the game could care less about you as a gamer. You’re only part of the world. Away from the incredible story and characters, the world allows a sense of unparalleled freedom. Riding around on your faithful horse, I spend my time cataloguing new animals, foraging for herbs and bringing back food for the camp. The simple things I call the ‘Silence Of Life’ draw me back into my second life as Arthur Morgan. The game that I really want to talk about is Gris. It’s one of those games that arrive at the right time of your life like the planets have perfectly aligned. I lost a close friend in December, so Gris was a tangible way to navigate through the emotional barriers inherent in the grieving process. The core of Gris is about unravelling the mysterious story of a girl. It’s a simple narrative with world-building symbolic of complex emotional concepts. The introduction of new abilities powering you up, teaching you that you own the confidence to take back control of your broken world. Gris is a chance for reflection to ultimately develop strategies to move towards acceptance and peace. Colour is symbolic of new growth, openness to new perspectives. You’re not simply moving through a beautifully designed environment, you’re moving through your own mental landscape. Every gameplay and the narrative element has symbolic value. Why would a journey through your mental landscape not be full of symbolic elements? Our unconscious mind is a mysterious place, with hidden secrets of meaningful value. The game uses different environments and sequences as tangible progression. The ‘Bird’ represents anger, the scream that pushes you back, letting you wallow in despair and reject help. The ‘Robot’ that joins you on your journey is your slow acceptance of help, his goodbye sequence teaches you that relationships are transient and maybe life can continue. The ‘Water’ level signifies your tears, diving deep into your sadness ready to unravel your mental pain. The ‘eel’ chases you out of the water demonstrating your ability to escape the total darkness. Releasing your guilt which blocked you for seeing the light at the end of the tunnel. Finally, the ‘Flower’ section, you discover that your voice activates the beauty of nature, that you control the happiness in your life. This liberation of your mental landscape gives you the freedom to focus on the beautiful happy memories of your loved one. Gris has a perfect ending, we arrive at a beautiful place where our separate mental jigsaw pieces slowly fit together. Illustrating that even through the toughest of times you are able to unite with your sense of self even after grief. Games like Gris elevate the gaming medium into an art form able to express mature emotional themes. The gaming industry recently is going through positive changes becoming much more inclusive for gamers with various abilities. 30% of gamers have a disability so companies cannot afford to alienate that valuable user-base. The awareness and application of accessibility has grown exponentially, now that developers are making their long overdue venture into this forgotten field. However, the effective usage of singular voices all working towards similar goals mean that those influential voices need unification. Playstation & Xbox have both made great efforts to include accessibility features with varying success. PlayStation developers like Naughty Dog (Uncharted 4: the Thief’s End), Insomniac games (Spider-Man), Santa Monica Studios (God of War) etc champion accessibility features in-game creating a gold standard to follow. This has pushed other developers to innovate with accessibility. The recent release of Shadow of the Tomb Raider was groundbreaking for a number of reasons taking the crown from Uncharted 4 by adding another layer of inclusive features for gamers with cognitive disabilities. You are able to alter the difficulty of these key gameplay elements: Combat, Exploration and Puzzles. For example, if you lowered the difficulty during puzzles Lara would instruct you exactly what to do step-by-step. God of War is a game known for epic fast-paced challenging fights, this is still the case. After release, many gamers were unable to activate the important ability of Rage Mode as it involved simultaneously pressing both analog sticks (R3+L3) so Santa Monica Studios listened to feedback and added an alternative configuration. Having the power of Playstation developers behind inclusion is a great win for all gamers but there’s definitely more the company could improve on. The accessibility leaders are definitely Microsoft & Xbox, they recently launched their paradigm-shifting Xbox Adaptive Controller (XAC). The XAC was designed primarily to meet the needs of gamers with limited mobility through strong partnerships with The AbleGamers Charity, SpecialEffect, Warfighter Engaged, and the disabled gaming community. 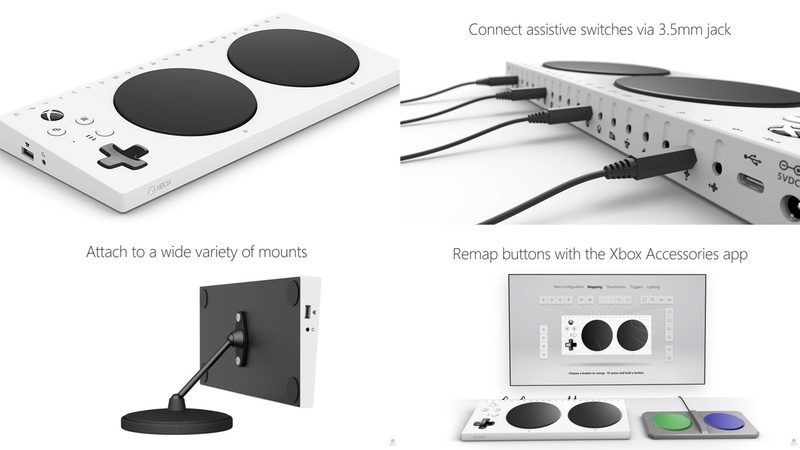 Input from these groups helped to shape the design, functionality and packaging of the Xbox Adaptive Controller. At the back of the XAC device there are 2 big buttons in the front corresponding to A + B and at the back are nineteen 3.5mm ports and 2 USB ports for external analog stick inputs. The XAC works in harmony with Xbox’s accessibility feature called Co-Pilot, this feature links 2 regular controllers together to act as 1 controller. So, whilst using a regular controller you can link it with the XAC. This means that gamers have the power over the controller and button placements, allowing you to connect a variety of switches or joysticks in the right place for you. It’s basically a unified hub connecting your own abilities with your gaming experience. Freedom & possibilities in a box. I was lucky enough to test the Xbox Adaptive Controller before launch. I’d never played on an Xbox One X before but now with a working setup I can play the racing game Forza 7. However, I’ve found that it does take time to find the right configuration and the right assistance. The possibilities are endless but it’s sometimes difficult to know the range of products available which connect to the XAC. It definitely will change gaming, it’s a simple idea with a huge impact, nobody can ignore accessibility now that Microsoft has made this bold statement. 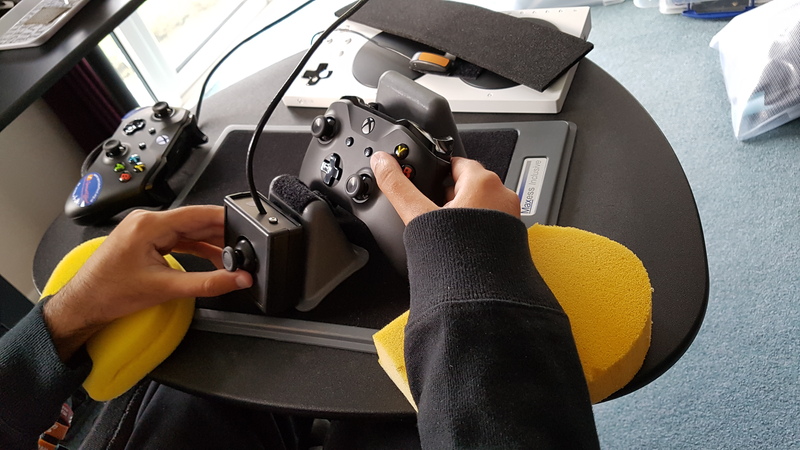 I’ve been asked several times by parents about how to adapt a controller for their son who is struggling with their favourite activity gaming. I had to face that fear a year ago, I thought the only solution to that problem was to just stop gaming. I recommend that if people are having difficulties with gaming don’t despair but contact the gaming charity, I mentioned earlier Special Effect. You can either visit their workshop in Oxford or they will visit you at home and help you to create a setup to ensure that you can continue enjoying gaming again. Gaming is more than just enjoyment, it’s been a lifeline for me especially during periods of isolation so I’m glad to see the beginning of accessibility thinking. All these positive steps are brilliant however the industry can definitely improve, we need Playstation & Nintendo to follow in Xbox’s footsteps. 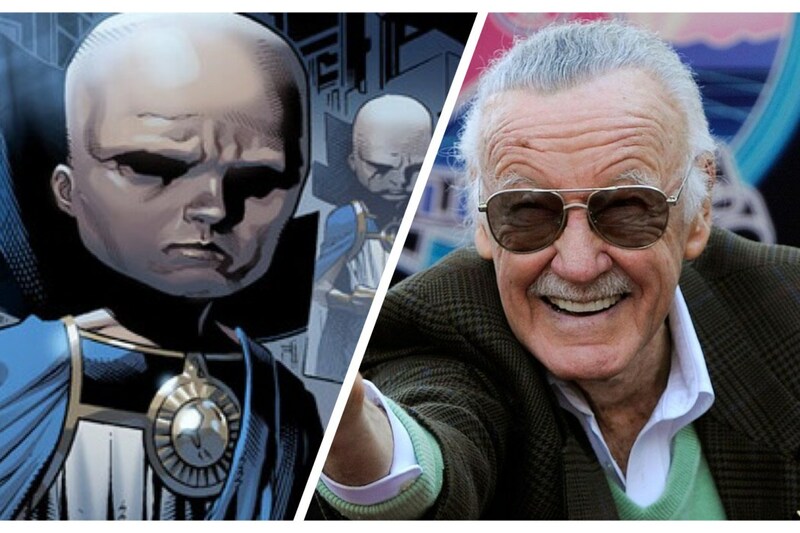 In dedication to the eternal legend Stan “the Man” Lee. #RIP. 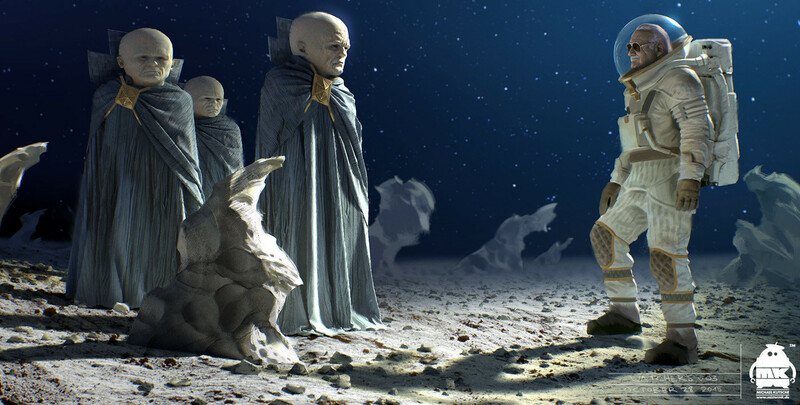 The ancient being named Uatu The Watcher ponders “The year 2018, it started off relatively similar to any other year so why am I here?” Uatu’s presence signifies the commencement of a major universal shift. That shift is occurring in the gaming industry, it’s called the Accessibility Revolution. 30% of gamers have a disability so companies cannot afford to alienate that valuable passionate user-base. The awareness and application of accessibility have grown exponentially, developers are making their long overdue venture into this hidden field to create an inclusive sanctuary. However, the effective usage of singular voices all working towards similar goals mean that those influential voices need unification. 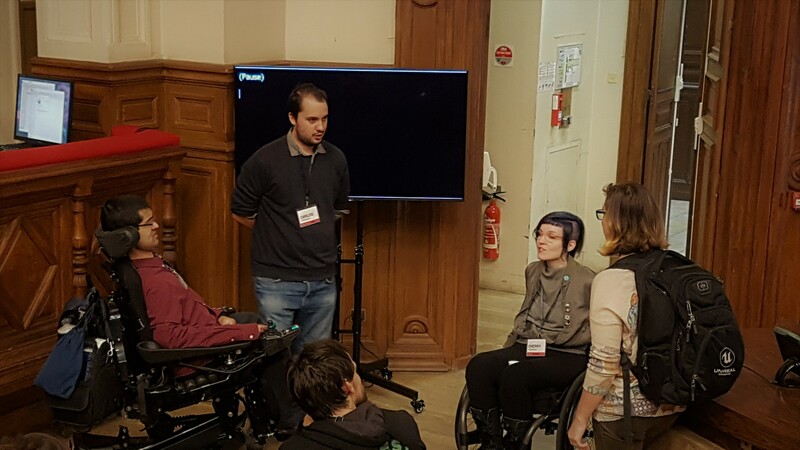 The GA Conference EU 2018 held in Paris on the 22nd of October was the perfect platform by bringing passionate disabled gamers together with talented developers to discuss the present and the future state of accessibility. Ian Hamilton (Director of GA Conf 2018 & an Accessibility Consultant), stated that consistent feedback from the “first two events in the USA were really successful” however potential guests or speakers from Europe “were unable to take part because they couldn’t make it across the Atlantic.” This meant that the “good work being done around Europe” wasn’t acknowledged or shared. True inclusion can only be created through spreading knowledge as widely as possible which was a key goal of the event. 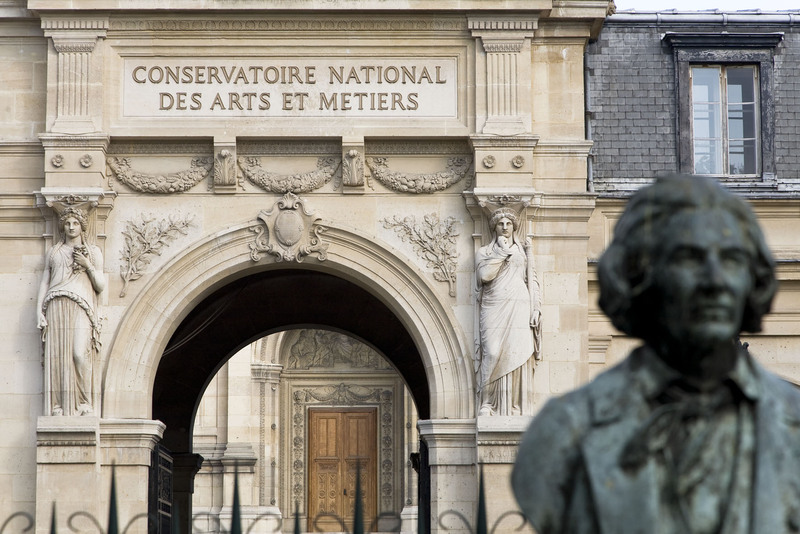 The GA Conf had brilliant sponsors, so thank you to Epic Games, Ubisoft, Paris Games Week, Shara and support from Microsoft. 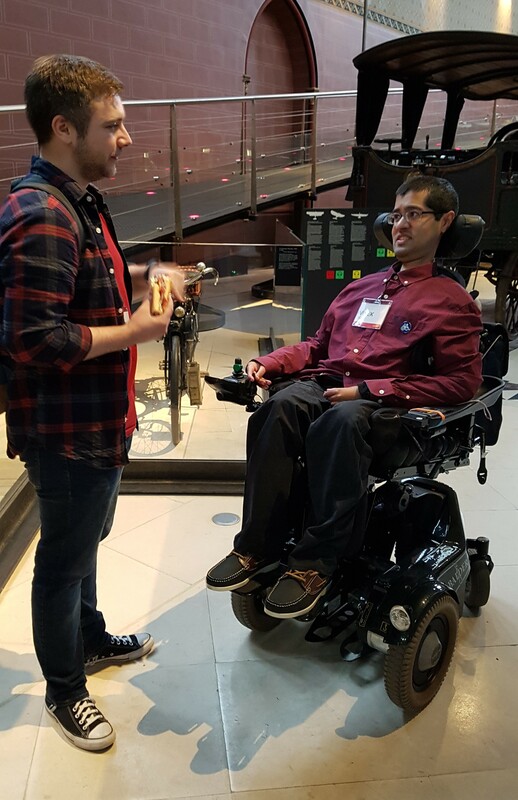 The GA Conference featured valuable educational talks covering a whole range of topics, presenting eye-opening talks about accessibility even for me as a disabled gamer. Developers need to be open to change or new ideas so that they can design accessibility features with the proper knowledge, to fully connect with the idea of making the industry a more inclusive space. It was excellent to see developers from big studios like Epic, Square Enix, Guerrilla, Ubisoft, Microsoft, PlayStation connecting and sharing ideas. Accessibility is gaining traction from every part of the gaming industry, so developers are attending in order to keep up with best practices. 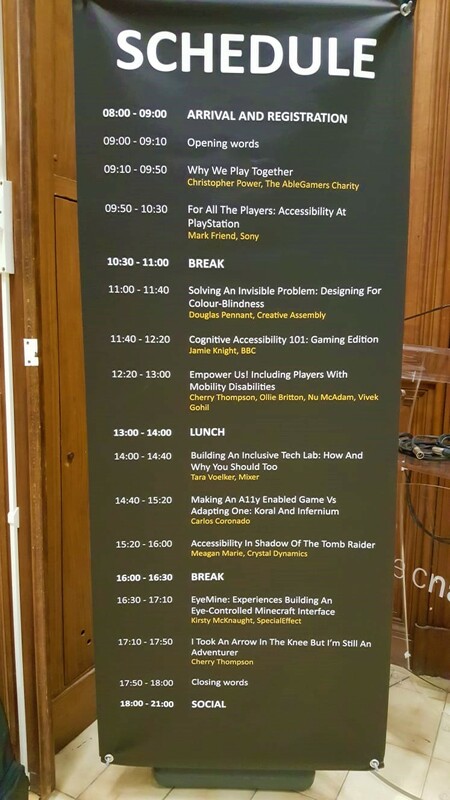 David Tisserand (Ubisoft Accessibility Project Manager) articulates that the event is “the single most informative conference… due to the diversity of the talks, from case studies, experts sharing detailed user needs and real-life stories”. The output of accessibility needs the input of collective knowledge so developers will not be at a disadvantage in the future when accessibility will become a vital part of game design. It’s important to think deeply about all forms of disability not just your own. I never realised the challenges faced by colour-blind gamers until Douglas Pennant the Associate Development Manager at Creative Assembly spoke about the invisible problem of designing games for colour-blindness. It’s impossible for someone without colour-blindness to detect these issues during gameplay design so it’s a tricky challenge to overcome. Jamie Knight BBC’s Senior Research Engineer explored gaming through an autistic lens. His talk on cognitive accessibility explored options that can aid users in receiving, processing & acting on information in a game world with too many cognitive stimuli. 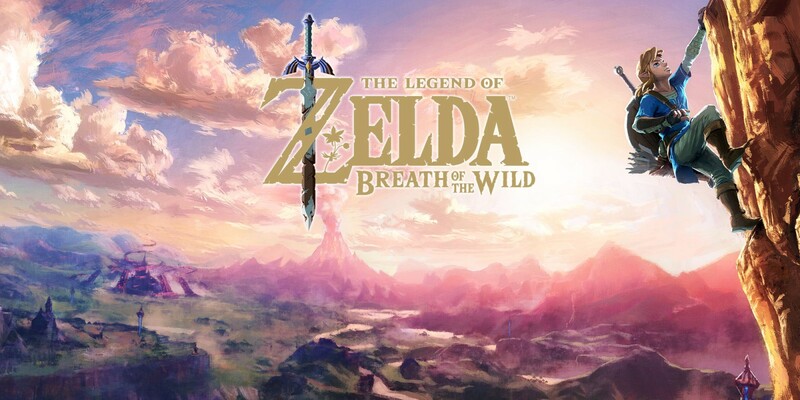 Open-world games with millions of icons can be overwhelming, games like Zelda Breath of the Wild provide a vast world that you can explore at your own speed. The panel Empower Us! Including Players with Mobility Disabilities was chaired by the inclusion advocate Cherry Thompson. 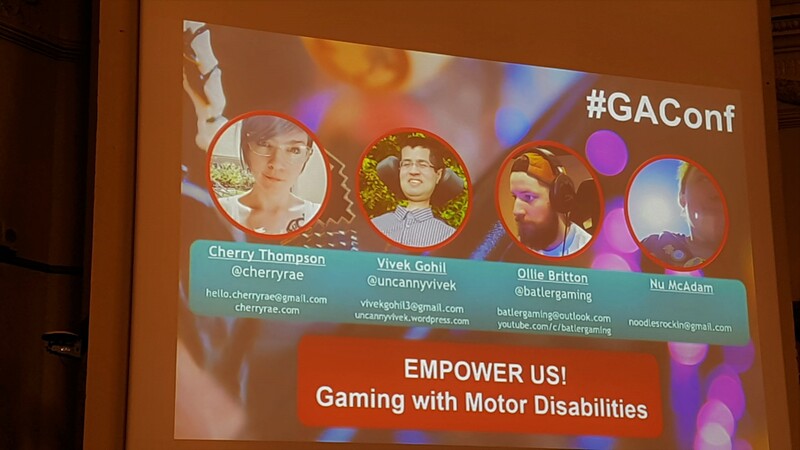 Gaming with a mobility disability had never been covered before, so having the platform to discuss experiences with the panel & answering questions from developers was empowering. We all agreed that including remapping buttons in the game should become standard, along with developers listening to feedback and consulting with disabled gamers. The Able gamers VP Chris Power opened the conference he said “The next step goes way beyond providing a list of options to bypass inaccessible mechanics. Accessibility needs to be a key part of the creative process & include disability representation in video games.” We need to consider this realistically, accessibility thinking in the industry is just beginnings so there’s still a lot of education ahead to get the fundamentals right. Mistakes only create the next stepping stones on our journey towards inclusion. 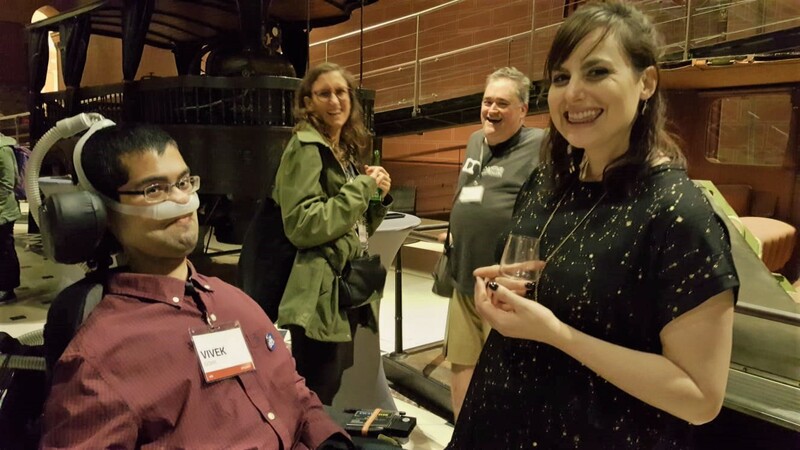 Tara Voelker (Co-Director of GA Conf, Xbox Gaming & Disability Community Lead) presented the Microsoft’s Inclusive Technologies Lab, a permanent space specifically dedicated to game accessibility. The lab has a multitude of vital applications from research, feedback from disabled gamers who visit & educating developers by tangibly demonstrating evidence of what an accessibility-centric space looks like. Personally, as a disabled gamer, finding my own setup was quite scary as it is a huge unknown. I wasn’t aware of the devices available, I couldn’t test the said equipment so a space like this would be vital. You don’t realise how powerful visual feedback can be especially for changing perspectives of developers who are fearful of designing accessibility features. During the whole event, we were joined by Bryce Johnson (Inclusive lead at Microsoft) who was heavily involved with the creation of the Inclusive Technologies Lab. Bryce exemplifies accessibility by celebrating the amazing Xbox Adaptive Controller. The possibilities are endless with the XAC. 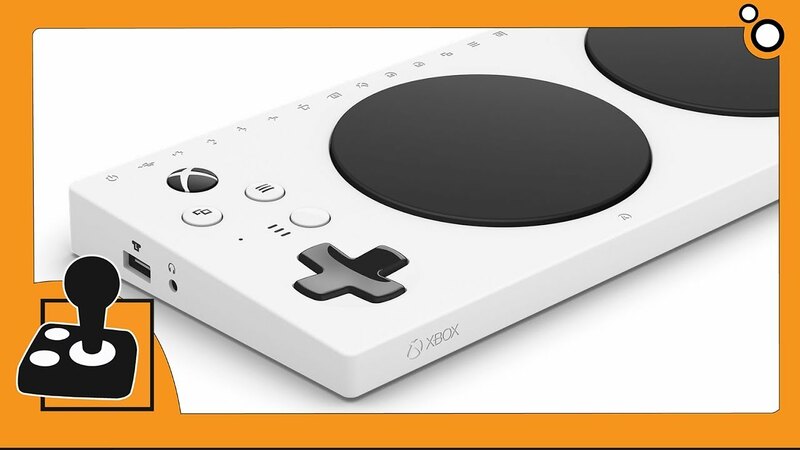 It definitely will change gaming, it’s a simple idea with a huge impact, nobody can ignore accessibility now that Microsoft has made this bold statement. The Tomb Raider retrospective by Meagan Marie illustrated how accessibility has been threaded throughout the whole Tomb Raider franchise. Earlier games included multiple pre-set controller configurations and lock-on aim, those options were accessible without Square Enix fully understanding the impact, they were decades ahead of their time. My first gaming memory was of playing Tomb Raider 2 and the safety of Croft Manor because combat scared my 7-year-old self especially when having to shoot tigers. This ability to explore Croft Manor in the earliest trilogy was a genius example of environmental storytelling, a safe playground reflecting Lara’s personality. Exploration not only had practical usage, but the mansion went beyond the detail necessary for a simple tutorial, it had the added benefit of unintentional accessibility. I personally loved searching for the secrets hidden in Croft Manor, this combat-free zone still allowed me to feel like a Tomb Raider without missing out on other gameplay elements. Throughout each iteration the Mansion evolved as part of the ongoing dialogue between developers and fans, so returning to it now, I admire Croft Manor as a feature ahead of its time. 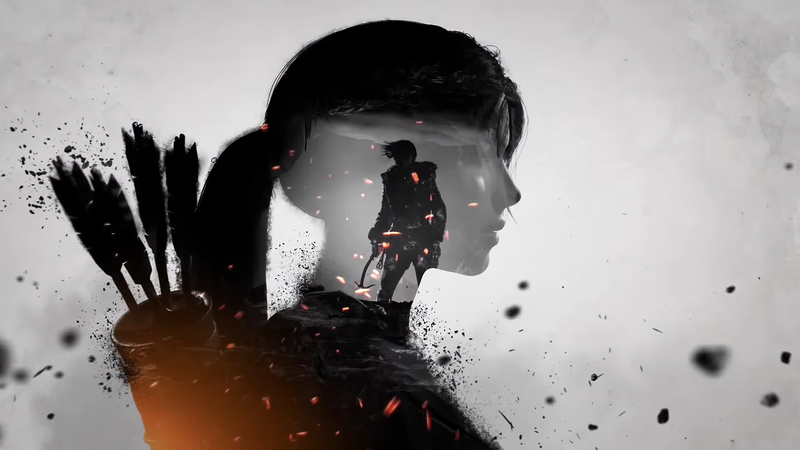 The recently released Shadow of the Tomb Raider was groundbreaking for its accessibility mindset, taking the crown from Uncharted 4 by adding another layer of inclusive features for gamers with cognitive disabilities. You were able to alter the difficulty of 3 key gameplay elements: Combat, Exploration and Puzzles. For example, if you lowered the difficulty during puzzles Lara would instruct you exactly what to do step-by-step. Meagan Marie felt that “representing the hard work of Shadow of the Tomb Raider’s accessibility advocates at the conference was a huge honour” and “a great opportunity for me to expand my knowledge base and bring learnings back to stakeholders at Square Enix.” Spreading awareness of great practice is important internally as a foundation to build upon but also externally for other game developers to reappropriate great ideas. Accessibility goes beyond mere company rivalries it’s all-encompassing so it requires a holistic approach. Strong examples of successful AAA developers working with an accessibility philosophy, hopefully, that will create a positive and convincing example for all developers. 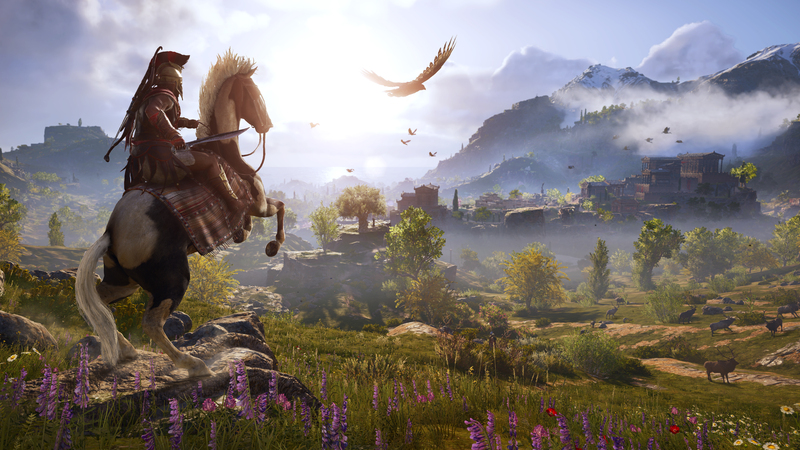 David Tisserand, “We’re trying to do exactly that on all Ubisoft franchises. 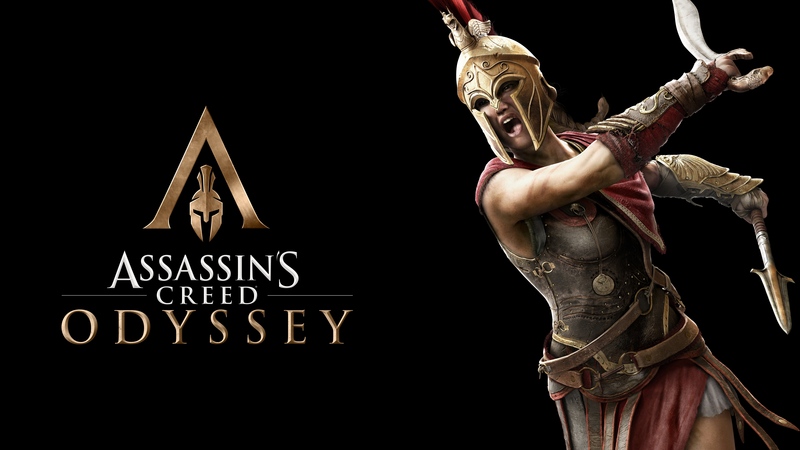 One feature at a time like the improvements from AC Origins to AC Odyssey.” Shadow of the Tomb Raider, Assassins Creed Odyssey and Spider-Man are huge commercial successes, so accessibility doesn’t hinder global sales. Kirsty McKnaught from Special Effect explained Eye Mine, the wonderful way to play Minecraft only using eye-gaze assistive technology. It’s a revolutionary step for accessibility, illustrating how flexible assistive tech can be even if you have rudimentary knowledge, as Ian Hamilton said, “Simplicity and flexibility can go a very long way, and open the door to all kinds of great things being layered on top.” The new Tobii Eye-Gaze 4C supports games like Shadow of the Tomb Raider and Assassin’s Creed: Odyssey so even more exposure of eye-control efficacy can only be a good thing. David Tisserand says “I always learn about new ways to communicate about accessibility. Be it, how to convince my colleagues to care and act, or a sentence/slide which describes very well a design challenge we must solve, or just learning how to communicate with the community. It may sound shallow to focus on communication, but I believe this is how you change mentalities and convince people to do the right thing.” I agree accessibility and inclusion rely heavily on advocates. Speaking of strong accessibility advocates, we ended on a high with Cherry Thompson passionately exploring disability representation in-games, it was absolutely insightful. 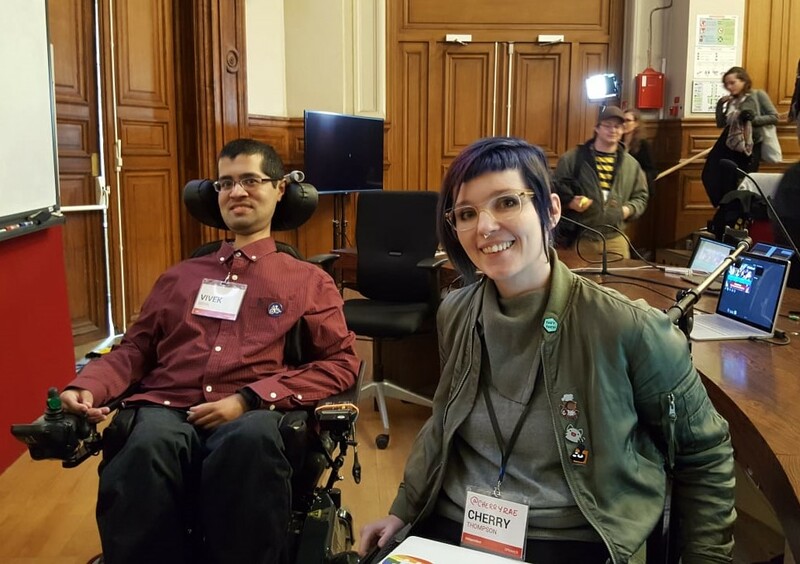 Accessibility should be a key element during all aspects of the whole creative process and as Cherry stated, it can and should also consider disabled representation in video games. Cherry said that gaming “saved my life” and for me it’s definitely the truth. Disability representation is more powerful than our understanding of it as it reaches into our heart. As Jamie Knight said, “If I exist in a game world it helps me persist in the real world.” As creators, you can’t be properly focusing on narrative design if you are not considering what all your players want, how they might feel and the impact you have left behind. The talk discussed games with extremely negative representations of disability or wheelchairs like Bloodborne, Life is Strange and how damaging it can be to gamers living with a disability. Cherry openly spoke about difficult topics such as Suicide, which is a common narrative stereotype of a disabled character. However, she loves the gaming industry and appreciates developers, we celebrated positive representation in games like Hellblade: Senua’s Sacrifice so progression is happening. It was such an insightful, and powerful end to the conference. With strong advocates such as Cherry, the gaming industry will evolve even faster into a space ready to fully embrace accessibility. I want to thank all the wonderful sponsors, everybody who attended, and the amazing people featured in this post. Without you, none of this would have been possible and the industry is now better for it. After reading this interesting article about the WHILL wheelchair, I decided to further investigate by visiting their website. Unsurprisingly I found the usual problems regarding the product design of disability technology and societal constraints of normality. Often, the designers of wheelchairs (or disability technology) are able-bodied, so the product is created on an assumption of need rather than through the involvement of disabled people. This is the trap that WHILL has fallen into with 3 able-bodied designers creating the WHILL for a disabled friend who was embarrassed to venture outside in his wheelchair. They wanted to create a mobility device to help disabled people feel confident. Hold on a second. As a fellow wheelchair user, the problem with confidence isn’t with the actual wheelchair but the anticipation of accessibility problems in the world around us. I already feel independent and confident sitting in my wheelchair. This inherent ableist thinking viewing people with disabilities are ‘wrong’ or embarrassing needs to be changed not just hidden with sticking-plasters of new technology. A wheelchair does not need to be considered as something to be shunned, society needs to accept that wheelchairs are useful tools for disabled people to live their life. They redesigned the ‘wheelchair’ from the ground up. Get this, with important features like colour customisation, foldability, an app to control your wheelchair remotely and seating the rider upright so they feel like they’re controlling a vehicle. Apparently, the WHILL has been designed with the user in mind. However, who has ever wanted to feel like they’re controlling a vehicle when sitting in a wheelchair? It sounds like an interesting concept but clearly highlighting the able-bodied designers’ assumption of requirements. Redesigning a wheelchair is not completely necessary as some options currently available are advanced already. The rhetoric that it has been designed with the user in mind is quite arbitrary as disability has a vast scope of people with varying needs. Define your users. This wheelchair isn’t designed for people with severe muscle weakness as there is no headrest or seating support. Do Aliens need Plastic Straws? Aliens want to arrive on a planet populated by intelligent peaceful lifeforms with less Plastic Pollution in the oceans but enough flexible Plastic Straws for their anatomy. Otherwise, this planet will not be accessible to them. Oh boy, I’m finally sharing my opinion on the present plastic straw crisis negatively impacting independence for the disabled population. I agree that we must care for our wonderful planet and live in harmony with the animals sharing Earth with us. Plastic pollution is a gigantic problem of our time, society needs to be more mindful of their effect on this unique planet. Focusing on individual products takes our focus away from the necessary discussions on global waste management. After our oceans are clogged with plastic maybe we can shoot our plastic waste into space. Disabled people are trying to live an independent lifestyle in a society and environment that isn’t always fully accessible to them. Nutrition, hydration and keeping healthy is vital in life, we all are supposedly meant to drink 2 litres of water daily. Interesting question, how do you independently drink if you cannot either lift your arms up or bend down? The answer is a plastic straw (or living in space). You might suggest that there are other types of straws available: from metal, paper, acrylic to wax. Paper straws disintegrate in a way that is dangerous for people with swallowing problems. Stainless steel straws are not safe for use in hot liquids and are difficult to hold with just teeth. Glass straws can have injury risks and are expensive. Straws that are straight are difficult to use because through experience the cup can easily tip over. This is not a big issue with cold drinks, but it is extremely dangerous when dealing with warm drinks. I require a straw which has the capability to bend or deform so that I can grip it easily with my teeth without fatigue. For me, the biggest benefit of a straw is that I’m in full control of the amount of liquid I’m sipping. Without this ability of the straw, I would easily choke whilst drinking because of my weak swallowing muscles. Who would want to choke in public? The embarrassment would not be the problem for me but the terrible consequences of potentially getting a chest infection leading to an unnecessary hospital admission. You cannot call yourself an accessible restaurant if your paying disabled customers cannot access a drink, you don’t expect customers to eat their meal without any cutlery. The problem with the alternative straw options is that they do not have the necessary attributes of a plastic straw. My solution to the plastic straw ban is simple, venues should stock small quantities of plastic straws to be available on request for disabled consumers. Also, if possible disabled people should try to re-use plastics straws at home. Please don’t alienate the disabled population or the aliens waiting to arrive on an inclusive accessible planet. Spoiler Warning: I will be talking about the story in To The Moon. To The Moon is a 16-bit Indie adventure game developed by Canadian game designer Kan Gao. Games like this are not usually on my radar but I’m glad that I embarked on this emotional journey with To The Moon. To The Moon is set in the future, you control two doctors who explore a dying man’s memories through technology in order to reconstruct them to fulfil his last wish. The 16-bit style is reminiscent of classics like Legend of Zelda however To The Moon has no combat mechanics or RPG elements only some puzzle solving tied into the story. The story intelligently tackles philosophical and emotional themes, which are rarely spoken about. Usually, AAA games like Far Cry 5, Doom etc are there to disconnect the gamer from their violent actions however To The Moon connects the gamer with their emotions. Creating a platform to think about their lives and the themes of mortality, love and existentialist thinking. Living with the terminal condition Duchenne Muscular Dystrophy has made me question my own mortality and trying to answer many existential questions. Last summer when I was at home my heart stopped, as you can obviously tell (because I’m typing this) I’m still here and earlier this year I lost my friend David Mayes. To The Moon reminded me of the tough questions I decided to answer by thinking about my wishes after I’m gone. To The Moon has the perfect music to make you genuinely ugly cry, the subtle piano notes and 16-bit art style transported me back in time to my childhood and having to stop playing the piano due to my muscle weakness. Discovering that I had an uncurable life-limiting condition was extremely tough, like Johnny there were parts of my memory with repressed feelings of anger, depression and guilt. For a long time, I wouldn’t face those parts unless I could reconstruct those memories. What I loved the most about To The Moon was that the story did not rely on negative depictions of Autism, it shows that autistic people can become adults and find love. Finally, I was worried that the story would change into the character River wanting to reconstruct her memories and ‘cure’ her autism. Many games seem to think that having a disability means that you want to be fixed with technology or powers (i.e. Wolfenstein II: The New Colossus). To The Moon reminds me of the equally profound game What Remains of Edith Finch, both games focus on mortality and death but through experiencing characters memories you realise that the inverse is true, these games are focusing on life. Games like these create lifelong memories by tapping into your heart, not your mind.